Although the Disney Cruise Ships Magic and Wonder are sister ships and nearly identical, one of the stark differences between these ships is at the main pool. 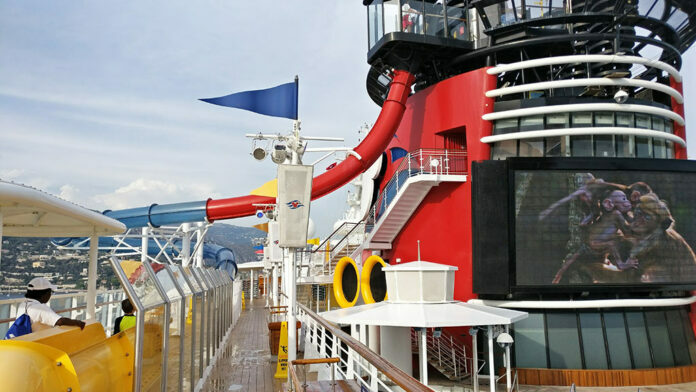 Both ships have the open top Twist and Spout signature yellow slide for guests taller than 38”, but only the Disney Magic has the AquaDunk slide. 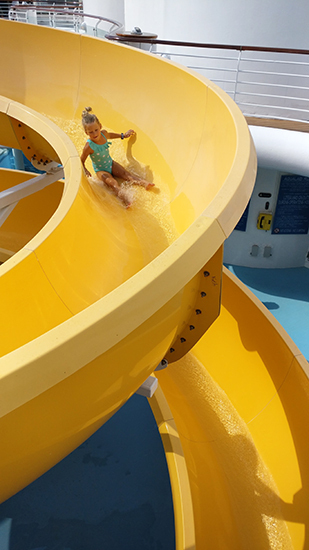 This slide is appropriately named a water coaster; an exciting, thrilling and slightly scary tube slide that sends you careening over the edge of the ship out into open water. The Disney Dream and Disney Fantasy also offer a water coaster named the AquaDuck which isn’t confusing at all or difficult to differentiate between the AquaDunk – which is still better in every way. 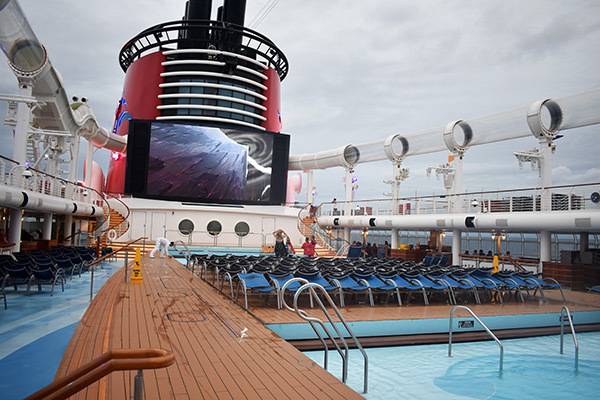 For this reason alone, if you are deciding between the sister ships Disney Magic or the Disney Wonder, the proverbial pool magic is only on the Magic. Disney literally misses the boat on the Disney Wonder by the lack of an AquaDunk. 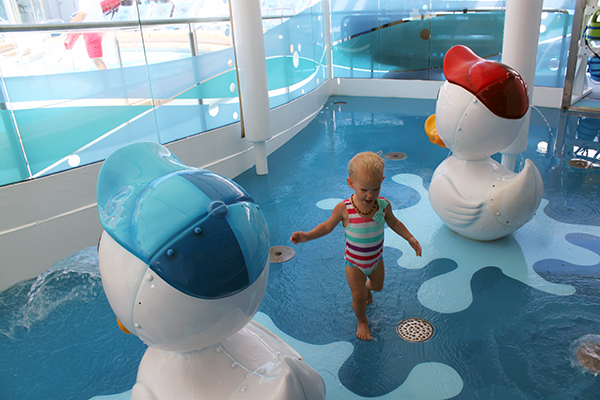 The characters and theming are different depending on which ship you are on, a combination of Mickey Mouse, Nemo and Friends, or three mischievous nephews, but this is the toddler area of the pool. There is a very shallow wading pool, geysers, dripping paint cans and bubbling fountains, and fun games with castmembers. Our older children had fun in the wading pool, but beyond that we didn’t enjoy this area at all. Our children have always been swimmers, and they’ve never been big fans of splash pads. We are the exception! Most kids will love this area, and it’s been designed for hours of play and fun. One very important distinction to understand about cruising with babies is that they are not allowed in standing water if they are not potty trained. Maritime law prohibits swim diapers in the pool. This was devastating for our baby Eclair who was just under two on our first cruise. She had mastered swimming, but was still in the middle of potty training. It was really good incentive for her during the cruise and when we got home and certainly sped up the process. But, it didn’t help her cause at all when it came to swimming on the cruise. We had to hide from her whenever the twins went swimming and it was impossible to explain to her. Toddlers can, however, play in the splash pad with swim diapers, but you’ll have to keep them clear of the wading pool. The Twist and Spout Slide empties into the AquaLab, though the entrance is up another deck. 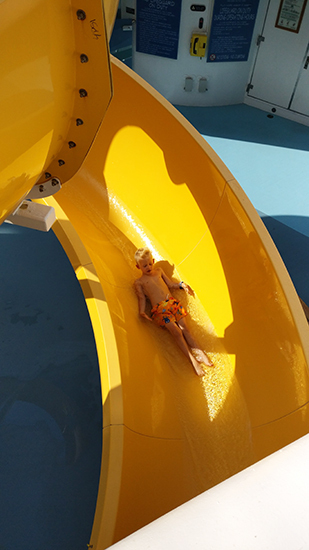 This is the signature yellow open slide for all guests taller than 38”. It is a twisty turn slide that weaves above the splash pad. It is a basic fun slide that little ones will enjoy, but it is not really all that fun. 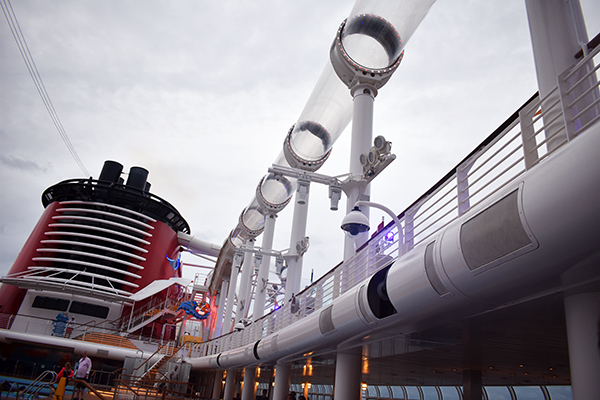 It is the only slide on the Disney Wonder. On the Disney Fantasy and Dream this yellow slide is named the the Mickey Slide and is much more compact. It has the same height requirement, but also comes with a height restriction as well. Goofy, Mickey or Donald’s Family Pool is the main pool. It is located mid ship and is in the center of the action. 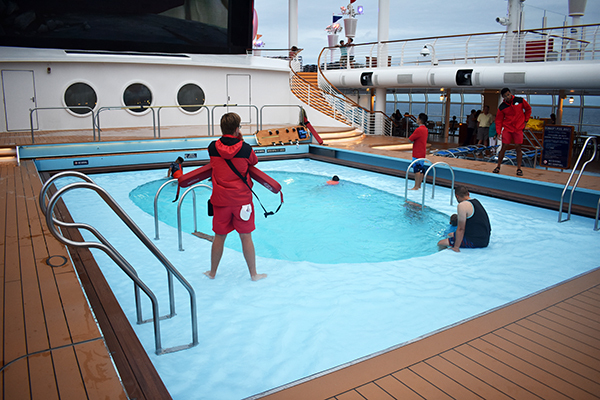 The pools have a depth of approximately five feet, depending on the movement of the ship and where you are in the pool as it moves. Lifeguards are always present and you may not jump into the pool. The pools on the Magic/Wonder versus the Fantasy/Dream have a much larger swimming area. The Donald Pool on the Disney Fantasy (I guess it’s shaped like an egg?). 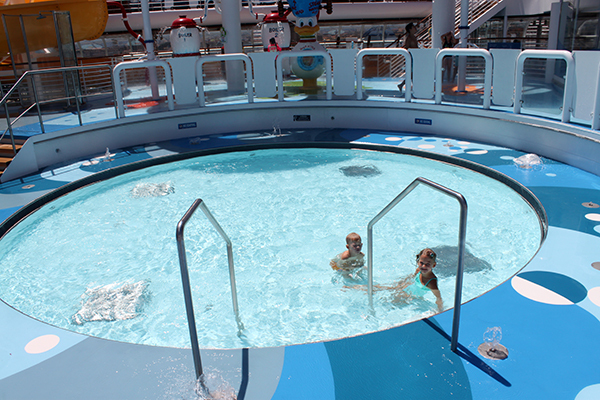 The Pools comprise the full rectangle on the Disney Magic and Wonder. This pool is in direct line of the Funnel Vision, Disney’s outdoor theatre. You can grab some food and lounge on the deck chairs to enjoy the kids swimming and watch a movie, or watch while you are swimming! The main stage is directly below the Funnel Vision, so at various points during sailing the pool will close. It will also be covered with a thick durable wooden cover and become part of the ship flooring where guests can stand to enjoy the festivities. Life vests are available for children of all ages and sizes at no cost. 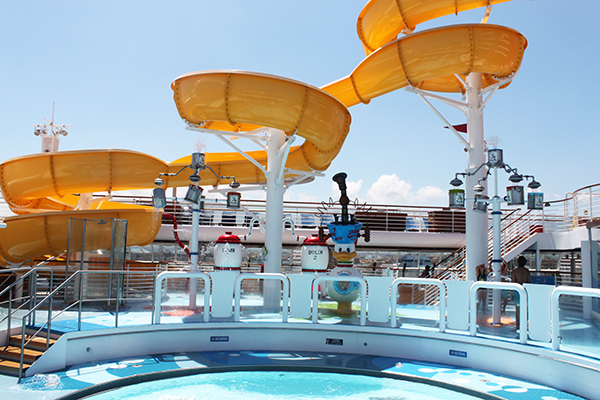 Two whirlpool tubs are located at the back of the main pool on the Disney Wonder and the Disney Magic. They are easily accessible from the main pool or the deck. They vary in temperature with one a bit warmer than the other. They are not very large, but we never had a problem with it being too full and wanting to relax in one at any time. On the Dream and Fantasy hot tubs are only located in the Adult Pool Quiet Cove. Up another flight of stairs leads you to the AquaDunk. The height requirement for the AquaDunk is 48”. 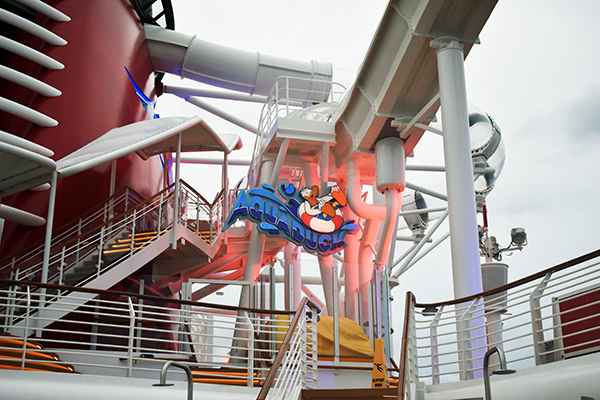 This slide is only available on the Disney Magic, and it is so, so, so fun! It’s worth booking a cruise on this ship just to experience it. This thrilling slide is an enclosed tube slide that shoots you down and out over the edge of the boat. You begin by entering a compartment with a solid foundation. A clear door will close around you and you’ll be completely enclosed. A lifeguard will instruct you to cross your arms and feet and then a countdown will begin. When you hear a buzzer the floor will drop from your feet and you’ll go crashing down, speeding through the tube with water splashing all around you! You’ll even go out over the side of the ship and shoot straight nearly down before winding around! Some parts of the slide are clear and visible, and some are dark, but it’s so fast and water is splashing you from every angle you can’t see anything outside. You’ll come out laughing and beaming ear to ear. It is exhilarating! The AquaDuck, on the other hand, is a mostly enclosed slide that wraps around the full circumference of the Dream and Fantasy ships, measuring 765 feet in distance. This raft tube slide is clear which means you can both be seen on the slide and watch the action below while riding the waves. Unlike the AquaDunk, it goes slow enough that’ll you’ll be able to see everything around you. Which how is that since it claims g-force roller coaster speeds? At night the slide lights up with neon flashing lights. The AquaDuck slide is an inner-tube slide made for two. Riders can ride alone if they are taller than 54″, but they must be at least 42″ to ride at all, and then they must ride with a partner older than 14. Regardless, rafts are all two person, so the choice is up to you if you breach the 54″ mark. When it comes to the AquaDunk or the AquaDuck, one letter makes all the difference. While the AquaDuck was fun, it certainly wasn’t thrilling. The AquaDuck is a much longer ride, with some parts that are faster than others, and some parts where you almost nearly come to a complete stop. Simply put, it isn’t a ride that you feel compelled to ride over and over and over again. The most exciting thing about the slide is the possibility that you might get stuck in it. The best time to ride and avoid lines are during the second dinner and show time – around 8:30 p.m. The adult pool is located further along the same deck near the Senses Spa. It is for guests 18 and older, and is much quieter and much less crowded. There are no slides, or movies, but there is an indoor bar and cafe at this location and plenty of lounge chairs. I went swimming in this pool once when the twins were at the Kids Club and Eclair and Gabriel were taking a nap, and it was total serenity. I didn’t know what to do with myself it was so quiet. Plus, the Cove Cafe offers complimentary snacks and the most delicious brownies I couldn’t find anywhere else. ► For Kids: The pools aren’t huge, but Disney has managed to make them incredibly fun. With slides, movies, and food, it’s a great way to spend the afternoon or evening. There is even a self serve ice cream station just around the corner! What do you think? AquaDunk or AquaDuck? Disney Magic or Disney Wonder? Family Pool or Adult Pool? 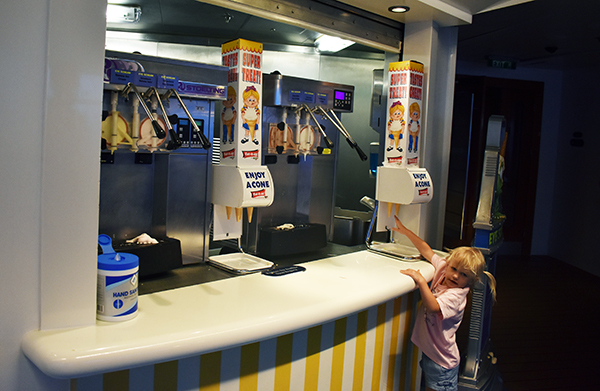 On Disney cruise ships, there is something for everyone! ► Nap-Time Version: How to idly waste away the day on a Disney Cruise ship splashing, swimming and playing in the pool! If your kids are sick of swimming, or don’t like swimming (gasp), take them over to the Kids Clubs for non-stop activities and action!